Pollinators are finally getting the attention they deserve. Many people know by now that pollinators are crucial to agricultural food production, but what about the pollinators in our own backyards? All of us can create refuges for our local pollinators, whether our gardens span acres or just a small balcony. Bumblebees: effective native pollinators, and adorable to boot! For many of us, the word “pollinator” brings to mind just one species: the European honeybee. Honeybees have naturalized into ecosystems across the US since their introduction by early European settlers, but they’re hardly the beginning or end of our local pollination story. While honeybees get a lot of attention because their large, portable colonies make them convenient pollinators for large-scale agriculture, many gardeners would prefer to invite as many pollinator species as possible to their backyard habitats. According to the USDA, there are over 4,000 species of native bees alone in the United States. That’s not counting the many species of ants, flies, wasps, beetles, birds, and bats that also pollinate our flowers and crops. Kind of mind-blowing, isn’t it? Did you know, for example, that not all bees live in hives or colonies? Honeybees and bumblebees are famous for their family-living proclivities, but most of the native bees in our area prefer solitary lives. And if you tend to think of yellow and black stripes when you think of bees, think again. Our local native bees come in solid black, orange, yellow, green, and blue. Some could easily fit on the tip of a pencil, while others are bigger than your thumb. And that’s just bees. What about our local hummingbirds, ants, wasps, and beetles? As fascinating as honeybees are in their own right, we’re certainly selling ourselves short when we limit our understanding of pollinators to just one species. If you use these tips for inspiration, I think you’ll be amazed to discover the variety of beautiful, strange, and fascinating pollinators that will soon call your garden home. This is one of the basic principles of ecology: diversity begets more diversity, and it all begins with plants. Native pollinators come in all shapes, sizes, and survival strategies. As a result, they differ in their tastes. Plant a mixture of flowering trees, shrubs, perennials, annuals, and groundcovers. Include plants with different bloom times, and with flowers of diverse sizes, shapes, colors, and scents. While Sky Nursery’s experts can certainly help point you to some plant that are particular favorites with our local pollinators, you can’t go wrong by providing a varied smorgasbord. While providing food sources goes a long way towards attracting native pollinators, you’ll need to provide shelter as well if you want them to stick around. Once again, diversity is the key. You’ll want evergreen plants to provide a canopy all year, as well as deciduous plants to lay down a cozy layer of leaf mulch. While shrubs and trees provide shade and nest sites for certain kinds of pollinators, other species prefer to build underground nests beneath thick sword ferns or other low-growing plants. If you want to jump-start your native bee habitat, try providing an artificial bee nesting box. There’s nothing wrong with including all kinds of plants in your pollinator-friendly garden, but consider including some native plants as well. After all, our local pollinators have evolved alongside these plants. Many native pollinators will happily adapt to anything with nectar, but including some natives ensures they’ll have food sources that are well-adapted to their needs. We’ve covered food and shelter, but pollinators also need water to drink. Any source of water will do – from a large pond or fountain feature to a simple rain-fed bird-bath. Even simply providing low, shady areas where water can naturally pool and evaporate slowly will usually do the trick. Be kind to your pollinators by avoiding the use of pesticides as much as you possibly can. Even organic pesticides don’t discriminate between aphids and bees. The best pest control approach for a pollinator-friendly garden is one based on – did you guess it? – diversity. By creating diverse habitat, you welcome predatory insects and birds as well as pollinators. It might take some time and patience, but a balanced ecosystem will eventually manage its own pest populations so that only limited and occasional human interventions are needed. Nearly a decade after Colony Collapse Disorder (CCD) first was reported in the United States, honeybees still are dying. Some states reported more than 50 percent losses in 2014. Many beekeepers have had to leave the industry. The U.S. Department of Agriculture (USDA) admits some studies have proved a class of pesticides called neonicotinoids are harmful to bees, but questions whether there’s enough proof to show neonics are the main culprit causing CCD. Scientists and public interest groups, however, feel it’s time to take action on the accumulating evidence. Some cities and nations are banning neonics and garden retailers across the country are feeling pressure not to sell them. In a couple of months, as the flowers start coming up, PCC shoppers who are gardeners can do some simple things to help save the bees. 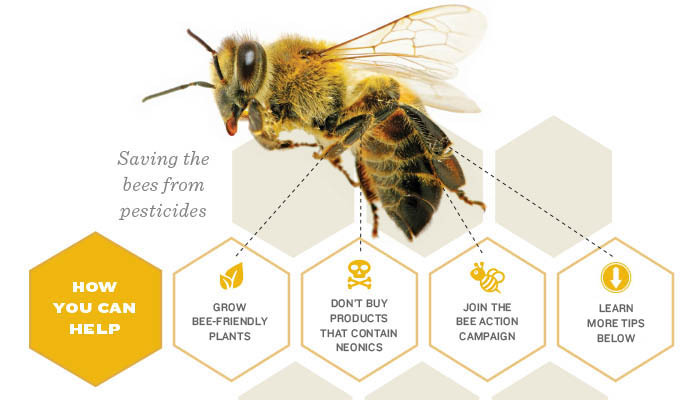 Modern agriculture calls for honeybees, but monocropping systems also demand pesticides. More than 5 billion pounds of weed killers, insecticides and fungicides were applied worldwide in 2013. Over the decades, the types of pesticides have changed. Arsenic and lead-based pesticides were killing bees long before DDT first was used as a pesticide during World War II. DDT was found to be damaging to insects in 1946, but wasn’t banned for agricultural use until 1972. Organophosphates entered the market, followed by pyrethroids. Neonicotinoid pesticides were developed in the 1980s. Gaucho (Imidacloprid) was the first neonic blamed for collapsing bee colonies in 1994 in France. Lab tests found Gaucho in the pollen of flowers. Beekeepers described bees as disoriented after foraging. In 2004 U.S. beekeepers started reporting losses, just one year after the U.S. Environmental Agency (EPA) registered a new neonic, Clothianidin. In 2006, when beekeepers reported 30 to 90 percent bee losses, scientists and beekeepers already suspected neonic pesticides. A growing body of research shows that as pesticides in the hive increase, hive mortality increases. After studying collapsed hives, in 2007 USDA scientists reported at least 50 different pesticides were in 98 percent of the comb and wax. The researchers also reported that these beehives were filled with more pathogens and viruses than non-collapsed hives. Then came a landmark study by Harvard researchers in 2014. It points to neonics as the main cause of CCD. Researchers treated 12 bee colonies with sublethal levels of neonics and kept six control hives free of the pesticides. All 18 hives made it through summer but when winter came, the bees in six of the treated hives disappeared, leaving behind empty colonies — a trademark of CCD. None of the six control hives saw bees vanish. It wasn’t the first study to show negative impacts of sublethal doses of neonics on bees. Earlier studies showed tiny doses of neonics affect bees’ ability to find their way back to their hives. A study in the journal Science found “field-realistic levels” of neonics resulted in diminished capacity for hives to produce new queens. Another 2014 study published in the Journal of Environmental Science and Pollution Research analyzed all the available literature on neonics and bees, 800 peer-reviewed reports. The Task Force on Systemic Pesticides — a group of global, independent scientists — found there is enough evidence of harm to bees and other pollinators to trigger regulatory action. Grow bee-friendly plants. Leave a weed patch and plant bee-friendly plants using only organic starts or untreated seeds in organic potting soil. Don't buy products that contain neonics.Avoid garden products with acetamiprid, clothianidin, imidacloprid, and thiamethoxam as active ingredients. See this PDF for a list of bee-friendly plants and more than 300 brands of neonic pesticides to avoid. Buy garden plants from reputable sourcesthat guarantee no neonics in the seed. Bee Action campaign. Take part in Friends of the Earth's Bee Action campaign. Write a letter to EPA administrator Gina McCarthy asking her to ban neonics. Download more bee-friendly gardening tips. Send a comment asking Congress to stand up for bees and support the Saving America's Pollinators Act. Europe is taking a cautionary approach to neonics. The European Commission voted to restrict use of neonicotinoids in 2013. The ban is only for two years and Syngenta (the world’s largest pesticide company) already has obtained emergency exemptions, allowing farmers to continue using neonics. Since neonics are persistent in soil, it’s uncertain what the future holds for bees in Europe. Here in the United States, EPA reportedly knew clothianidin was toxic to bees before the pesticide’s release in 2003, but the manufacturer, Bayer, won approval after producing a study since criticized as flawed. In June, President Obama issued a federal strategy to protect pollinators and called on EPA to assess the effect of neonics on bees within 180 days. EPA announced recently it won’t release a regulatory decision on neonics until 2016. But another agency, the U.S. Fish and Wildlife Service, will ban neonics in wildlife refuges starting in 2016. The Minnesota Department of Agriculture says it is authorized to impose strict limitations on neonics, particularly given a new EPA report finding that the pesticides do little to boost soybean production. Municipalities already are taking action. Eugene and Cannon Beach, Oregon; Orgunquit, Maine; Shorewood, Minnesota; and Spokane and Seattle all recently passed bans against use of neonicotinoids on city property. The Seattle City Council resolution also calls for a national moratorium on neonicotinoid pesticides and asks EPA to suspend registration of neonics. Beekeepers and lawmakers on Vashon Island are talking about banning neonics. In Ontario, Canada, lawmakers moved to enforce stricter regulation. Agriculture Secretary Tom Vilsack announced in November $4 million in assistance to help farmers in the Midwest improve the health of honey bees. It reportedly will provide guidance about ways to reduce erosion, increase soil health, inhibit invasive species, and provide quality forage and habitat for bees and other pollinators. It’s hard to imagine $4 million will make a difference, however, since Reuters reports neonicotinoids are used routinely on more than 100 million acres of U.S. corn, wheat, soy and cotton. Meanwhile, consumers and environmentalists are taking matters into their own hands. The environmental group Friends of the Earth has targeted home improvement stores Lowe’s and Home Depot with petitions and protests, asking the retailers to eliminate products and plants treated with neonics. Friends of the Earth and Pesticide Research Institute in 2014 found 51 percent of common garden plants purchased at retailers, including Lowe’s, Walmart and Home Depot, contained neonics, with no warning to consumers. Home Depot now says it’s requiring suppliers to label all plants treated with neonicotinoids. It also says it’s working with its suppliers to find alternative insecticides. Protests outside Lowe’s stores across the United States and Canada in October haven’t yet had the same impact. Lowe’s says it will follow EPA’s guideline on pesticides. In 2013, 50,000 bumblebees from 300 colonies were killed in a parking lot in Wilsonville, Oregon, when Safari (dinotefuran), a neonic, was sprayed on Linden trees. In 2012, more than 50 Canadian beekeepers reported bees were killed by neonic-laden dust blown from pneumatic seed-planting machines. In 2013, the Ontario Beekeepers Association reported 37 million bees were found dead in Elmwood, Ontario, after seed-treated corn planting in the spring. Seventy-five percent of dead bees had significant levels of neonicotinoids.